Tropical cyclone intensity is a complex topic. Winds are often used to measure intensity as they commonly cause notable impacts over large areas, and most popular tropical cyclone scales are organized around sustained wind speeds. However, variations in the averaging period of winds in different basins make inter-comparison difficult. In addition, other impacts like rainfall, storm surge, area of wind damages, and tornadoes can vary significantly in storms with similar wind speeds. Pressure is often used to compare tropical cyclones because the measurements are easier to measure and are consistent. Tropical cyclones can attain some of the lowest pressures over large areas on Earth. However, although there is a strong connection between lowered pressures and higher wind speeds, storms with the lowest pressures may not have the highest wind speeds, as each storm's relationship between wind and pressure is slightly different. In the most recent and reliable records, most tropical cyclones which attained a pressure of 900 hPa (mbar) (26.56 inHg) or less occurred in the Western North Pacific Ocean. 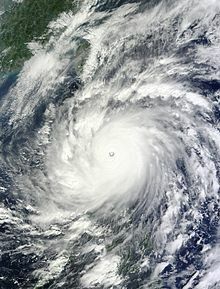 The strongest tropical cyclone recorded worldwide, as measured by minimum central pressure, was Typhoon Tip, which reached a pressure of 870 hPa (25.69 inHg) on October 12, 1979. The following list is subdivided by basins. Data listed are provided by the official Regional Specialized Meteorological Centre, unless otherwise noted. 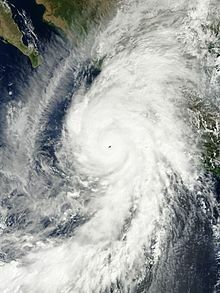 On October 23, 2015, Hurricane Patricia attained the strongest 1-minute sustained winds on record at 215 mph (345 km/h). The most intense storm in the North Atlantic by lowest pressure was Hurricane Wilma. The strongest storm by 1-minute sustained winds was Hurricane Allen. See List of Category 5 Atlantic Hurricanes for additional information on strong storms in the Atlantic basin. See Notable non-tropical pressures over the North Atlantic for intense extratropical low pressure values over the North Atlantic. The most intense storm in the Eastern Pacific Ocean by both sustained winds and central pressure was Hurricane Patricia. Its sustained winds of 345 km/h (215 mph) are also the highest on record globally. Storms with a minimum central pressure of 925 hPa (27.32 inHg) or less are listed. Storm information was less reliably documented and recorded before 1949, and most storms since are only estimated because landfalls (and related reconnaissance) are less common in this basin. See Category 5 Pacific Hurricanes for a full list of category 5 hurricanes in this basin. 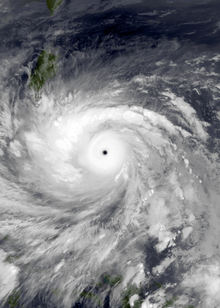 The most intense storm by lowest pressure and peak 10-minute sustained winds was Typhoon Tip, which was also the most intense tropical cyclone ever recorded. Storms with a minimum pressure of 900 hPa (26.58 inHg) or less are listed. Storm information was less reliably documented and recorded before 1950. 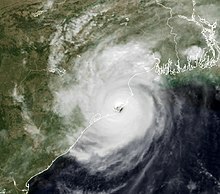 The strongest tropical cyclone recorded in the North Indian Ocean is the 1999 Odisha cyclone, with 3-minute sustained winds of 260 km/h (160 mph) and a minimum pressure of 912 hPa (26.93 inHg). Storms with an intensity of 950 hPa (28.05 inHg) or less are listed. Storm information was less reliably documented and recorded before 1971. The most intense tropical cyclone in the South-West Indian Ocean is Cyclone Gafilo. By 10-minute sustained wind speed, the strongest tropical cyclone in the South-West Indian Ocean is Cyclone Fantala. Storms with an intensity of 920 hPa (27.17 inHg) or less are listed. Storm information was less reliably documented and recorded before 1985. 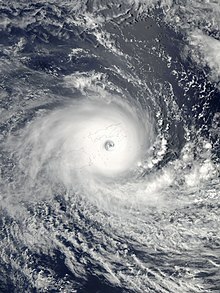 The most intense tropical cyclones in the Australian Region are Cyclone Gwenda and Cyclone Inigo. By 10-minute sustained wind speed, the strongest are Cyclone Orson and Cyclone Monica. A total of 16 cyclones are listed down below reaching/surpassing that intensity, which most of them occurred during El Niño seasons. Tropical cyclones that have been recorded since the start of the 1969–70 Tropical Cyclone year and have reached their peak intensity to the west of 160E are included in the list. The most intense tropical cyclone in the south Pacific, Cyclone Winston of 2016, is also the most intense storm in the Southern Hemisphere. Until recently, it was not known that tropical cyclones could exist in the southern Atlantic. However, Hurricane Catarina in 2004, to date the only hurricane in the south Atlantic, brought additional review. A subsequent study found that there was an average of 1-2 subtropical or tropical cyclones per year in the Southern Atlantic in recent decades. No official database of South Atlantic cyclones exists, but a partial list of notable tropical and subtropical systems is listed. ^ Officially listed by the BoM as 914 mbar, pending review. ^ Kossin, James (February 2015). "Hurricane Wind–Pressure Relationship and Eyewall Replacement Cycles". Weather and Forecasting: 177–181. Bibcode:2015WtFor..30..177K. doi:10.1175/WAF-D-14-00121.1. ^ Dunnavan, George M; Diercks, John W (November 1, 1980). "An Analysis of Super Typhoon Tip (October 1979)". Monthly Weather Review. 108 (11): 1915–1923. Bibcode:1980MWRv..108.1915D. doi:10.1175/1520-0493(1980)108<1915:AAOSTT>2.0.CO;2. Retrieved February 24, 2013. ^ Sanchez, Ray (October 23, 2015). "Hurricane Patricia weakens, but still 'extremely dangerous'". CNN. Retrieved October 10, 2018. ^ a b c d e f "ATCR report plan". www.usno.navy.mil. Retrieved 2017-10-21. ^ C. L. Jordan (September 1959). "A Reported Sea Level Pressure of 877 MB" (PDF). Monthly Weather Review. 87: 365–366. Bibcode:1959MWRv...87..365J. doi:10.1175/1520-0493(1959)087<0365:wnarsl>2.0.co;2. Retrieved May 9, 2017. ^ "Western North Pacific Typhoon best track file 1951–2019". Japan Meteorological Agency. 2010-01-13. Retrieved 2010-01-13. ^ Regional Specialised Meteorological Centre (RSMC) - Tropical Cyclones, New Delhi. "IMD Best track data 1990-2016". India Meteorological Department. A guide on how to read the database is available here. ^ "Cyclone Damia Best track". Météo-France. 2001-05-16. Retrieved 2010-01-08. ^ a b La Reunion Tropical Cyclone Centre. Cyclone Season 1993–1994 in the South-West Indian Ocean (in English and French). Météo France. pp. 42, 65. Retrieved December 22, 2013. ^ La Reunion Tropical Cyclone Centre. Cyclone Season 1994–1995 in the South-West Indian Ocean (in English and French). Météo France. p. 67. Retrieved December 22, 2013. ^ La Reunion Tropical Cyclone Centre. Cyclone Season 1995–1996 in the South-West Indian Ocean (in English and French). Météo France. pp. 25, . Retrieved December 22, 2013. ^ La Reunion Tropical Cyclone Centre. Cyclone Season 1996–1997 in the South-West Indian Ocean (in English and French). Météo France. p. 33. Retrieved December 22, 2013. ^ La Reunion Tropical Cyclone Centre. Cyclone Season 1999–2000 in the South-West Indian Ocean (in English and French). Météo France. p. 72. ISBN 2-9511665-3-2. Retrieved December 22, 2013. ^ a b c La Reunion Tropical Cyclone Centre. Cyclone Season 2001–2002 in the South-West Indian Ocean (in English and French). Météo France. p. 4. ISBN 2-9511665-6-7. Retrieved December 22, 2013. ^ La Reunion Tropical Cyclone Centre. Cyclone Season 2003–2004 in the South-West Indian Ocean (in English and French). Météo France. p. 67. ISBN 2-9511665-8-3. Retrieved December 22, 2013. ^ La Reunion Tropical Cyclone Centre (November 27, 2009). "Very Intense Tropical Cyclone Adeline-Juliet". Météo France. Archived from the original on December 24, 2013. Retrieved December 22, 2013. ^ La Reunion Tropical Cyclone Centre (November 27, 2009). "Intense Tropical Cyclone Bento". Météo France. Archived from the original on December 24, 2013. Retrieved December 22, 2013. ^ La Reunion Tropical Cyclone Centre. South-West Indian Ocean Cyclone Season 2005–2006 (in English and French). Météo France. p. 6. ISBN 2-9511665-9-1. Retrieved December 22, 2013. ^ La Reunion Tropical Cyclone Centre (November 27, 2009). "Very Intense Tropical Cyclone Hondo". Météo France. Archived from the original on December 24, 2013. Retrieved December 22, 2013. ^ La Reunion Tropical Cyclone Centre (August 31, 2010). "Very Intense Tropical Cyclone Edzani". Météo France. Archived from the original on December 24, 2013. Retrieved December 22, 2013. ^ Kerr, Jack (26 December 2014). "Tropical Cyclone Mahina: Bid to have deadly March 1899 weather event upgraded in record books". Australian Broadcasting Corporation. Archived from the original on 2 April 2015. Retrieved 6 March 2015. ^ Masters, Jeffrey. "World Storm Surge Records". Weather Underground. Retrieved 6 December 2017. ^ "The Australian Tropical Cyclone Database" (CSV). Australian Bureau of Meteorology. A guide on how to read the database is available here. ^ Evans, Jenny L; Braun, Aviva J (2012). "A Climatology of Subtropical Cyclones in the South Atlantic". Journal of Climate. American Meteorological Society. 25: 7328–7340. Bibcode:2012JCli...25.7328E. doi:10.1175/JCLI-D-11-00212.1.